It is hard to think of positive things that can come from your whole country going on a strike in protest of the government, but a situation as tough as that one had a surprisingly positive effect on my life. 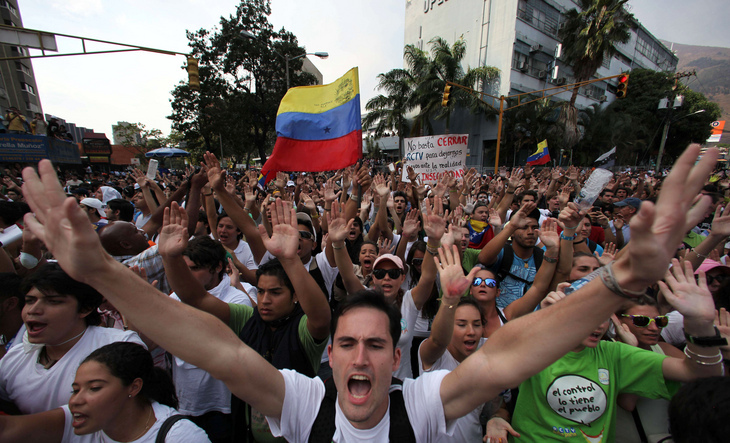 In 2002, Venezuela went on a national strike to protest because the citizens no longer wanted President Hugo Chávez in office and all the efforts to get him to resign had been unsuccessful. I spent a number of weeks without going to school, not fully understanding the situation at the young age of 12. Breaking her nose and wrist might not sound like good luck, but now she didn’t have to face the decision of whether to join the strike, considering she could barely get out of bed. The weeks that followed were scary for everybody in the country. A riot broke out during a protest on April 11, resulting in the death of many people. It was said in the news that Chávez had resigned and the country celebrated victory, only to hear him state two days later that he had never resigned and was still in control. The country was still in a state of uncertainty as the president took some time during his TV show to read lists of people who had been fired from PDVSA. The lists also appeared in the daily newspapers, this is how people found out whether they still had a job. Every day we would read the lists over and over and watched “Aló Presidente” to see what the fate of the family was going to be. There was no reason for my mother to be fired, so we never found her name in the lists. Although this was a relief, the future was still uncertain. The headquarters in Caracas, which is where my mom worked, were about to be shut down by the government. One night, after the strike was over and everyone had returned to everyday life, my parents came home from work in a sullen mood. They sat me and my older sister down on the couch to talk. They told us that the company was relocating the remaining employees to other cities. “Would you prefer to move to Puerto la Cruz or Maracaibo?” my mom asked. These cities were both far away from the capital and moving to either one would be a big change in our lives. My sister was going to stay in Caracas because her major was not offered in any other university in the country, so the decision was basically up to me. Ever since I was young we would spend summer or Christmas break in Puerto la Cruz, a coastal city lined by islands that attracts a lot of tourists. I had always loved our vacations by the beach, so I quickly made up my mind. Although it was a tough decision for a family to make, we didn’t have a choice and had to quickly change the course of our lives. My parents had to move right away while I stayed behind with my sister to finish the school year. My dad, who has been working on drilling sites and platforms, decided to take an office job in the same company as my mom so the family could stay together. My sister was 19 and we were basically living alone, so I spent a lot of time with my grandmother and aunts. Soon enough the school year was over and it was time for me to move to Puerto la Cruz with my parents. I was sad to leave my friends and my hometown behind, but I was actually exited to be moving to a city that I had always loved. After a couple months of vacations and adjusting to my new home, I enrolled in a new school, which was a bit scary. I thought it would take me a long time to make friends in an environment that was so unknown to me, but I was quickly meeting people and having fun. In no time, I had a close group of friends who are still my best friends today. I missed my friends and family in Caracas, but Puerto la Cruz was now my home. I grew to love living by the beach and in a town that was much more relaxed than the big city. After a long process of adjusting, my parents also grew accustomed to this laid back environment. During my time living there I was also lucky to meet many musicians involved in the local music scene. This allowed me to explore my love for music and find a passion that I might not have discovered otherwise. I was able to learn about this art and appreciate it in a deeper way. The circumstances which resulted in me moving to Puerto la Cruz were not ideal, and the political situation in my country has not gotten better. Everyone I know in Venezuela is currently struggling and fighting for our country, in the hopes that we can one day make it better. Among all these negatives, I had a chance to find a place I will always call home and a group of people that I consider to be like family. Without these things, I would not be able to get through the hard times, and that is why I am grateful that my life took the unexpected turn it did. Great 🙂 i love to be part of ur story nita..